GRS Tools 003-684 MicroBlock Ball Vise with Accessory Set, 30 Pieces. Like larger GRS vises, the MicroBlock is machined from solid stainless steel and finished with a special low glare treatment to reduce eye strain. It features a self-centering jaw system and an adjustable internal brake system that allows the user to choose the amount of rotational resistance. The MicroBlock's low profile and compact design is especially suited for microscope work or other situations where the size of a larger vise is an obstacle. Includes leather-faced ring clamps plus a variety of pins and other clamps that fit the upper jaw plates of every GRS Block. These 30 pieces help you instantly solve the problems of holding, so you can start working. Designed for a unique combination of solid work support in a small and maneuverable size, the MicroBlock has a self-centering jaw system made for stone setting, small engravings, and other precision work. The internal rotational brake system lets the user choose the amount of rotational resistance from free to locked. Its low profile is suited for microscope work. Includes 4 pins, 2 wrenches, 6 screws, plastic base, 1 plastic hex key, and Thermo-Loc Sample Kit. Ball Diameter: 3.1 (80mm). Jaw Width: 1.6 (46mm). Jaw Height: 0.87 (22mm). Jaw opening: 2 (50.8mm). Also available without 30-piece accessory kit. Our products are never used, reconditioned, or rebuilt. Both options are available on request at additional cost. If you are satisfied with our service, please leave us a. Your recognition will make us more confident to develop business, serve you better, and provide more competitive pricing. We understand the concerns and frustrations you might have, and will do our best to resolve the issues. Please give us the opportunity to resolve any problem. We try our best to reply to your emails as soon as possible, however, due to high volume of daily incoming emails and time zone difference; we may not be able to reply your emails immediately. By purchasing our item(s), you agree to accept these terms and conditions. 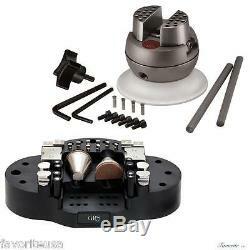 The item "GRS Tools 003-684 MicroBlock Ball Vise with Accessory Set, 30 Pieces" is in sale since Wednesday, June 25, 2014. This item is in the category "Jewelry & Watches\Jewelry Design & Repair\Jewelry Tools\Engraving Tools". The seller is "favoriteusa" and is located in New York, New York. This item can be shipped worldwide.